The following document was originally published by Iran Affairs blogger Cyrus Safdari. Among the lessons learned from the revolutions in Egypt and Tunisia is the value and affect of unencumbered access to information and communications technology (ISCT), including but not limited to independent information and social networking across multiple platforms, such as mobile, internet, web-based, and satellite broadcast. The current ICT available in and outside Iran remain largely silod platforms (i.e. lacking technology that facilitates convergence of information and interactivity). In general, the younger generation that support reform and actively oppose the regime from within have not been able to effectively access newer technologies or have been dissuaded from participating in communications programs operated by less legitimate traditional opposition parties from outside. Most these platforms are either state sponsored, like VOA and BBC, or are exile opposition websites and channels out of Los Angeles with a political agenda and low tolerance for alternative viewpoints. Most have failed to stay up to date with the language, trends, mentality, culture, and sociopolitical situation of the today Iran. The partisan nature of the older generation opposition groups further limit their ability to reach the younger demographic. The traditional opposition groups based outside Iran do not maintain the legitimacy, technical capability, or political synergies to collaborate with the new generation of civil society organizations in Iran. Moreover, none of the existing available communication platforms effectively leverage digital content and networking by combining interactive mobile, internet, web, and satellite based secure communications vehicles. The Democracy Council, in response to requests from prominent activists and organizations representing the Green Movement and other emerging sectors of civil society to collaboratively develop and deploy a “virtual sanctuary” for reform – minded Iranians to communicate, inform, network, organize, and advocate with each other and the larger Iranian society as well as the outside world. Currently, a significant amount of digital networking and content is produced by organizations affiliated with the Green Movement and independent civil society organizations (CSOs) in and outside Iran. However, distribution and leveraging f such content is limited by: 1. Technology available to CSOs, 2. Unaccommodating regional distribution platforms, internet, web and satellite based, 3. Lack of resources or skills to circumvent censorship and security regimes, 4. Lack of shared practices and resources. TCN will provide solutions to these four issues. In addition, CSOs and activists will merge their communications’ operations into the TCN platform to facilitate immediate and leveraged impact in Iran and the Persian-speaking world. For example, TCN will leverage the databases, mailing lists, and informal and formal marketing and advocacy operations through the single branded portal. These individual CSOs and independent producers would continue to manage their networking and marketing operations through the larger platform. 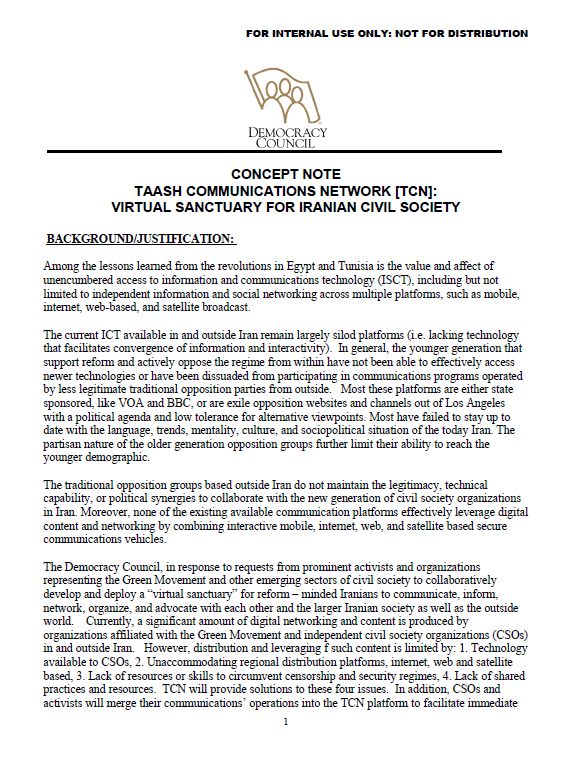 Taash Communications Network (TCN), developed by the Democracy Council (the Council) in collaboration with the leading representatives from the Green Movement, will help to meet this demand by providing the first robust, multilevel (internet, web, mobile, and satellite broadcast) communications channel for regionally produced progressive (uncensored) content and communications. TCN will operate as branded technological distribution portal (platform) made available to independent content and communications produced by and for progressive and reform – minded Iranians. TCN will be the Facebook, twitter, NPR, and C-Span of Persian media under one roof with a focus on social and political issues concerning the Iranian public inside the country, in the region, and abroad. It will be a uniting factor that is demand-driven (commercially sustainable). TCN will not produce content but provide technical services for the benefit of Iranian civil society. · Advanced online (e.g. social networking) and mobile tools to secure unfettered access, availability, and interactivity to the content. · Branded Persian Language video broadcast platform TCN would be owned by the nonprofit TCN Foundation registered in a European country, such as Denmark. The foundation’s mission would be to make available an independent, branded Persianlanguage communications platform that is available for high-quality user-generated programming. content for distribution by many different TCN platforms. This informative, educational, and entertaining medium will actively engage, inform, inspire, and link Iranians without censorship. To meet the demand of the target market, foreign films, generally illegal in Iran for containing progressive themes, would be acquired and dubbed to augment the original programming. Such content would be distributed and made accessible through multiple mediums: a secure website that contains social networking applications, and utilizes mobile and circumvention tools, and a robust satellite broadcast channel. TCN would work collaboratively with local and regional CSO’s to design and deploy a strategic audience acquisition program leveraging new technologies and viral techniques. Each independent producer would manage their own networking and advocacy component as a back end to their own regular internet or TV programming. TCN provides the technical background to ensure high penetration, distribution, and secure accessibility.